You should be redirected automatically in a few moments, but if not, please click here to see if Liver Birds, Imaginary Cities, and Open Doors has made the transition. Liver Birds revealed: One of my favourite things about Liverpool is the Liver Bird. It’s not only part of the city’s heraldry, but a centrepiece of the people’s hearts. It’s a public figure; it belongs to everyone. And this means it’s everywhere. There’s even a great Little Book of Liver Birds which tells you where to find them. Recently, the Echo has posted a gallery with a few select examples. The gallery shows just how varied – and yet perpetually recognisable – the things are, and how they can be found everywhere from municipal buildings to offices to… dentists! Read about Liverpool’s hidden flock of Liver birds on the Liverpool Echo website. Liverpool Museum’s objects online: It’s a tough job running a museum website. How can you possibly put all your institute’s objects online for those people who can’t get there in person, or for academics to do some research? Web design is a tricky art. Well, the Liverpool Museums group have been looking at how they do just this, and have posted a blog on the thought processes which go into designing a useful resource. They also point out a few ‘Star’ objects to get you started on your explanations. And these objects are great, drawing you into the collection as a whole. Congrats to the team on a job well done! Read about the Liverpool Museums collections being put online. Dale Street history: The Liverpool1207 blog as always been of interest, and I’ve followed the Twitter account for years now, swapping the odd comment here and there. On the blog recently, however, there’s been a run of great posts which link Liverpool’s history with current events. I’m not able myself to do some of the detailed research which is on display, so this is great to read. The latest is about the future of Dale Street, one of the original seven streets of the town and always a main thoroughfare for new arrivals to the banks of the Mersey. It’s also the site of potentially controversial development, with its historical buildings and valuable land values coming into conflict. The article is a ‘state of the nation’ for Dale Street, showing which buildings are vacant, alongside their original use. It’s damning, in all honesty. Let’s hope the planning committee are reading! Read about the future of Dale Street over on Liverpool1207. Imaginary Landscapes: I’ve recently been reminded that the landscape – urban, historical, social – is made by people. People design it, people decide how it ‘feels’ and how it changes. And over the centuries artists, philosophers and writers have imagined landscapes that don’t even exist (yet). Or have pondered what might have happened if history had gone slightly… differently. Darren Anderson has collected a lot of these ideas in his Imaginary Cities, a beautiful and bold book inspired by the accounts of the traveller Marco Polo. Polo has been accused of making up parts of his travel diaries (see Marco Polo Never Got to China), but this book aims to prove that this was far from the case. In fact, it tries to convince us that even imaginary cities exist, if only in our minds. Read an overview of the book Imaginary Cities by Capioca on Medium, or buy the book itself on Amazon. Heritage Open Days 2015: And finally, this year’s brilliant Heritage Open Days (or HODs to those in the know) are upon us (10th – 13th September). This is the event where an unparalleled cornucopia of historic buildings is open to the public. As well as being able to poke around inside buildings which are normally out of bounds, there are often events or tours which help you make the most of the extra access. Every year, new buildings are added to the agenda, while faithful regulars allow even more people to come inside. There is a special website dedicated to the HODs, but as a bonus the Urbansubrosa blog by Brian Sayle has collected a handful of churches which are opening their doors. He gives you the address and the opening times, which give a flavour of the type of thing you can expect from a HOD. And, as he’s a photographer, there are a few excellent pics there too. Read a list of all the Heritage Open Days on Merseyside, and see Brian Sayle’s blog post about some of the sites which are opening this weekend. That’s it for this post, folks. Tune in next time when I’ll have a bunch of new pages for your delectation! 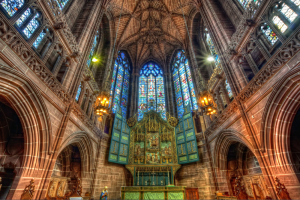 Image: Lady Chapel Altar by Miroslav Petralko, released under a by-nc-nd Creative Commons license.